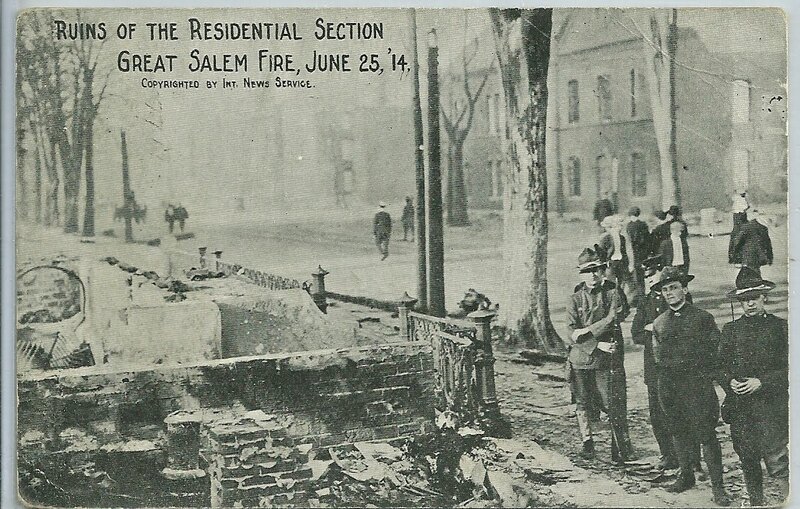 Two real photo postcards of the Great Salem Fire of June 25, 1914, Salem, Massachusetts. 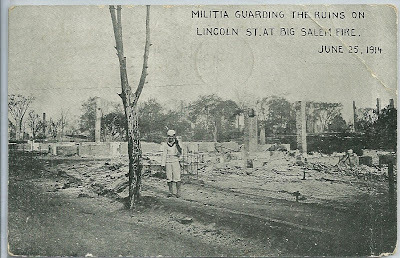 One of the messages on the reverse of the cards, postmarked July 27, 1914, reads, in part: "Some sight to see", which I believe refers to the writer's shock at seeing the aftermath of the fire. 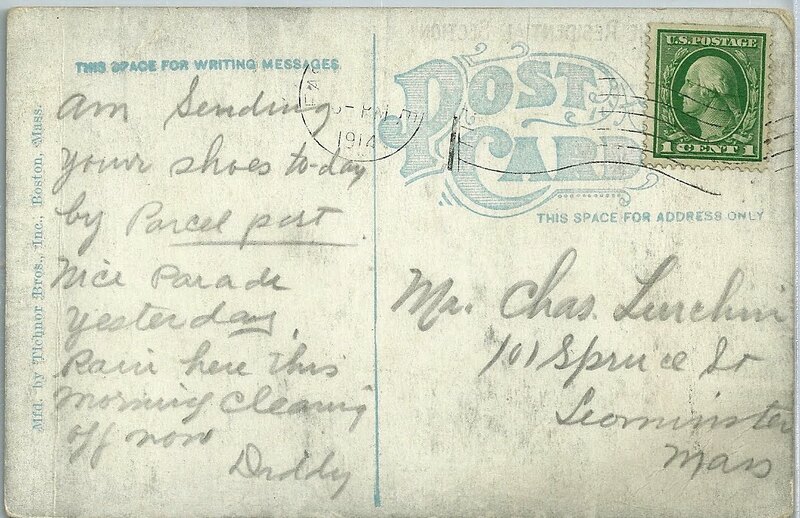 I'm not able to read the postmark on the card shown above, except for the date of 1914 at the bottom. I can almost see an EA, but I don't want to get ahead of myself and assume that means Eastport, just because the addressee, Charles Lurchin, was born there. The second postcard shows a militia man guarding the ruins at Lincoln Street. This one has a clear postmark that reads Lynn, Massachusetts, July 27, 1914. 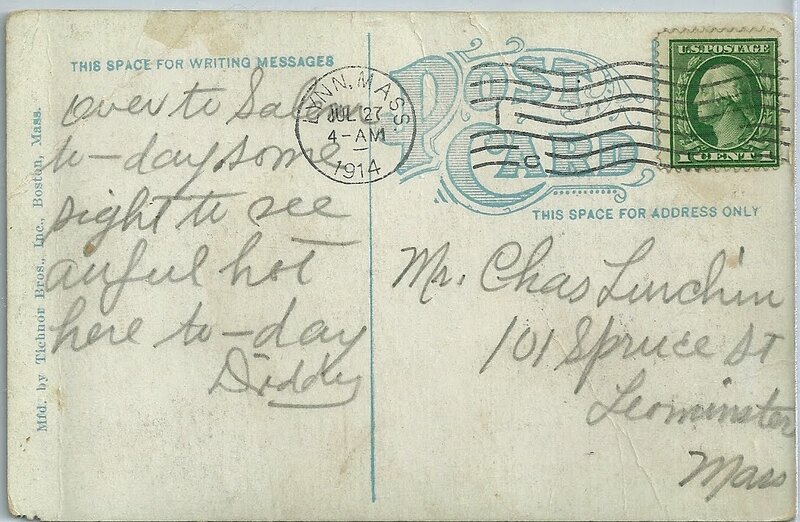 The postcards are addressed to Mr. Charles Lurchin at 101 Spruce Street, Leominster, Massachusetts. They appear to be signed by "Diddy". I found Charles Lurchin in Leominster in the 1910 and 1920 Censuses. I also found his World War I and World War II draft registration cards; the latter shows that he was born in Eastport, Maine, on January 13, 1886. From what I could gather online, Charles was the great grandson of a British Naval officer, James Lurchin, who deserted and settled in downeast Maine. He married Anna Nancy Blackwood; one source gives the marriage date as December, 1814; another 1818, though there was a son born in 1816. Either way, this is an interesting story, as Eastport, Maine, was captured by the British in July of 1814 and not handed back until 1818. Was Lt. James Lurchin faced with the prospect of having to sail away in 1814 or 1818 and leave his love behind? I'll be researching this story further for a future blog post. If you have information to share, I would very much appreciate your getting in touch with me. This story could be incorporated into the War of 1812 commemorations that Eastport, Maine, is planning: the start of the war in 1812; the capture of Eastport by the British in 1814 and the return of Eastport to the United States in 1818. 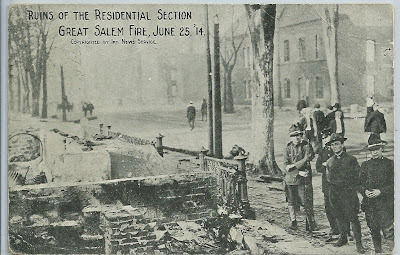 At the very least, I hope you find these postcard scenes of the devastating Salem fire interesting; perhaps you will find them meaningful from the genealogical perspective as well. Until I started researching today, I had no idea I would be delving once again into the War of 1812 era in downeast Maine. Fun! 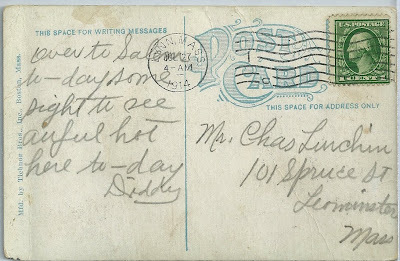 I love old postcards! I've been collecting them for years. These are so interesting because they are real photos of an historic event. Thanks for sharing!